Downloading the latest versions of your favorite programs is a tiring task, especially on a fresh installation of Windows. Navigating through the mess of websites and download links is frustrating, waiting for the installers to download is boring, and running each one separately is annoying. InstallPad can help you. It takes a list of your favorite programs and will download and install the ones you pick. It doesn't need to ask any questions, so you can go do more important things. 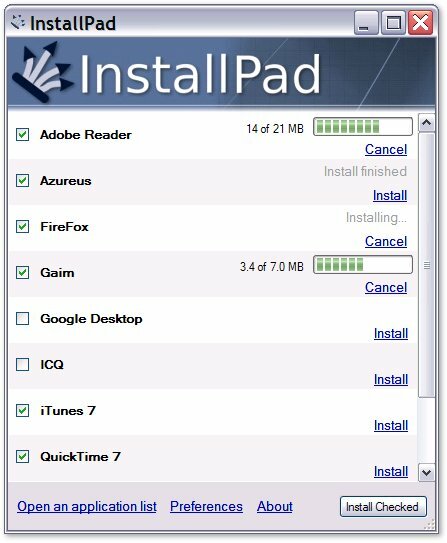 InstallPad can resume downloads you've canceled, and can even try and find the latest version of your program online. If you administrate or develop for Windows, InstallPad can help you get a machine set up with service packs, applications or development tools without the need for CDs or running lots of scripts. With it you can quickly install a host of programs silently, pass arguments to the installers, and run post-installation scripts. InstallPad is free for personal use. Enjoy. Download InstallPad version 0.4 (see what's new). InstallPad 0.4 requires the Microsoft .NET framework 2.0. See here for instructions. Also see information about adding new applications to your list.